A trio of teenagers are blessed with telekinetic powers after coming in contact with a strange glowing object. Each handles their new-found abilities in different ways. Matt’s (Alex Russell) inner superhero is slowly awakened. Already brimming with confidence and swagger, Steve (Michael B. Jordan) takes it all in stride. The overly timid Andrew (Dane Dehaan) gradually comes out of his shell, but years of being bullied at school and at home have given him a pronounced dark side. He obsessively documents his entire life on video, and manages to capture the trio’s super-powered experiments and misadventures in great detail. With each use, their powers grow exponentially. In Andrew’s case, that metamorphosis has tragic results. Chronicle is yet another entry in the moribund “found footage” genre. Multiplexes have recently been blitzed with a gaggle of such films, which usually fit neatly into the horror category. Chronicle marries the “found footage” approach to the world of superheroes. The resulting film treads some very familiar ground, but ultimately proves much bolder than any number of similarly themed projects. Perhaps director Josh Trank and cowriter Max Landis thought the “found footage” gimmick would be a good way to distinguish the moderately budgeted Chronicle in a marketplace already swarming with superheroes. That choice proves to be a blessing and a curse. The conceit feels increasingly forced as the film progresses. As Andrew’s character arc approaches its logical conclusion, it seems ever more unlikely that he would feel the need to document his every waking moment. One can easily understand the allure of this technique. It allows for easy exposition, and plays perfectly into the audiences voyeuristic fantasies. Such benefits notwithstanding, the decision to shoot the entire movie in this way is a glaring misjudgment in an otherwise airtight film. The one place where the found footage conceit proves most beneficial is in the apocalyptic events that take place during the closing act. It allows the ensuing mayhem to be seen from something of a first person perspective, increasing the tension exponentially. The viewer is plunked right in the middle of the action and thus disoriented. This is perhaps one of the best and most necessary uses of shaky cam ever attempted. It reduces the viewer to the position of spectator as super-powered beings decimate a major city. Chronicle provides the audience with three very sympathetic and likeable characters. The dramatic scenes in most found footage movies are often a chore to watch. In the Paranormal Activity films, they act as filler, padding out the running time between jump scares. Chronicle, on the other hand, is populated with living breathing characters. Trank and Landis appear to have taken a page from the Stan Lee handbook, observing how ordinary people react to extraordinary circumstances. Each character represents one of the many personality types found in the microcosm of high school, but they are allowed to be more than the sum of their parts. One of Chronicle’s many charms is how simply and easily it goes about its business. It offers just enough exposition before moving on to the next moment or event, never dwelling on anything a nanosecond longer than it has to. There are pretty much no major set-pieces save for the final act, but the film manages to be exciting and engrossing regardless. The characters are allowed to have fun with their powers in scenes that would likely feel meandering in lesser hands. Here, they play as character development and story progression. Dane Dehaan provides the film’s broken heart. He’s more than the proverbial 90lbs weakling presented in most superhero stories. His home life has rendered him ineffectual. His inability to assert himself in any way makes him a powder keg of pent up rage. Even as he descends into madness and megalomania, he remains sympathetic. Matt and Steve are a bit less flamboyant, though each goes through a somewhat more subtle evolution than Andrew. The events that they experience together bring them closer, and give each of them insight into each other. The actors make these sometimes manipulative machinations feel genuine and organic. Chronicle takes two ideas that would seem to be diametrically opposed, meshes them together, and comes up with something that feels familiar yet fresh. Those who are seasoned in such stories will know exactly where the plot is going, but the film manages to make even the most cliched developments feel new and exciting. 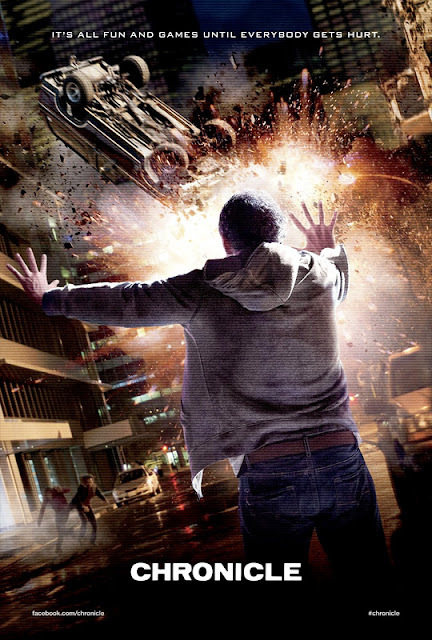 Chronicle is an unexpectedly stunning and tragic take on the superhero genre.